My views on Brexit haven’t changed since I wrote “The Economic Case for Brexit” back in 2016. It’s a simple issue of what route is most likely to produce prosperity for the people of the United Kingdom. And that means escaping the dirigiste grasp of the European Union. The European Union’s governmental manifestations (most notably, an über-powerful bureaucracy called the European Commission, a largely powerless but nonetheless expensive European Parliament, and a sovereignty-eroding European Court of Justice) are – on net – a force for statism rather than liberalization. Combined with Europe’s grim demographic outlook, a decision to remain would guarantee a slow, gradual decline….Leaving the EU would be like refinancing a mortgage when interest rates decline. In the first year or two, it might be more expensive because of one-time expenses. In the long run, though, it’s a wise decision. That’s because Prime Minister Theresa May and other opponents are pushing for a watered-down version of Brexit. Sort of Brexit in Name Only. Indeed, Dan Hannan, a member of the European Parliament, explains in the Washington Examiner that the deal negotiated by Theresa May is the worst possible outcome. This is the sort of deal that a country signs when it has lost a war. Under its terms, Britain will remain subject to all the costs and obligations of EU membership, but will give up its vote, its voice and its veto. …EU exporters will enjoy privileged access to the world’s fifth-largest economy. They won’t need to worry about world competition. 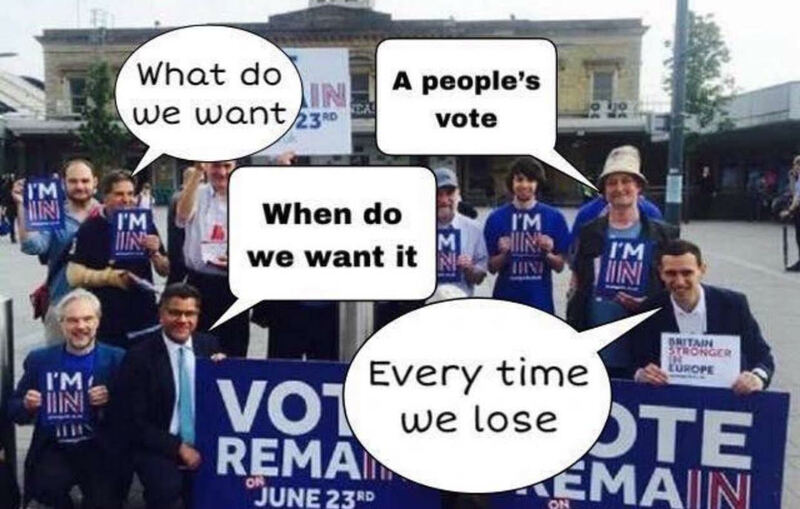 …In the two-and-a-half years since the referendum, civil servants, politicians, financiers and politically-connected business cartels have worked assiduously to overturn to result. …Some, including George Soros and Tony Blair, sought to overturn the result outright with a new referendum. Others, more craftily, sought instead to ensure that, while something technically called Brexit may happen, nothing actually changes. Sadly, they have achieved something far worse than no change. Their deal — Theresa May’s deal — will leave Britain in a more disadvantageous place than either leaving cleanly or staying put. It keeps the burdens of EU membership but junks the advantages. Brian Wesbury and Bob Stein, both with First Trust Advisors, point out that Hard Brexit is the best option. Trade would continue, but based on WTO rules instead of the EU’s free trade agreement. Some analysts and investors are concerned about a “Hard Brexit,” in which the U.K. supposedly plunges into chaos as it crashes out of the EU without an agreement. …Count us skeptical. …Any harm to the U.K.’s economy would be relatively mild… It’s not like there would be no trade between the U.K. and the EU after a Hard Brexit. Trade rules would simply shift to the ones that apply between the EU and other countries under the World Trade Organization, like those that apply to EU-U.S. trade. While WTO rules are quite good, they’re not as good as complete free trade. But there would be pressure to move in that direction under a Hard Brexit. …the EU would be under enormous pressure to lower tariffs and cut a new deal with the U.K. In 2017, the rest of the European Union ran a roughly $90 billion trade surplus with the U.K. So if a Hard Brexit makes it tougher for the rest of the EU to export to the U.K., every national capital in the EU would be flooded with lobbyists asking to cut a deal. Meanwhile, leaving the EU means the U.K. would have the freedom to make free trade deals with the U.S. and Canada, and any other country it wanted, without having to wait for the EU. Yes, a Hard Brexit risks some financial jobs, but the same argument was used when the U.K. decided not to join the Euro currency bloc, after which London kept its role as Europe’s financial center. For what it’s worth, I’m more interested in whether we can get a really good trade deal between the US and UK following a Hard Brexit. 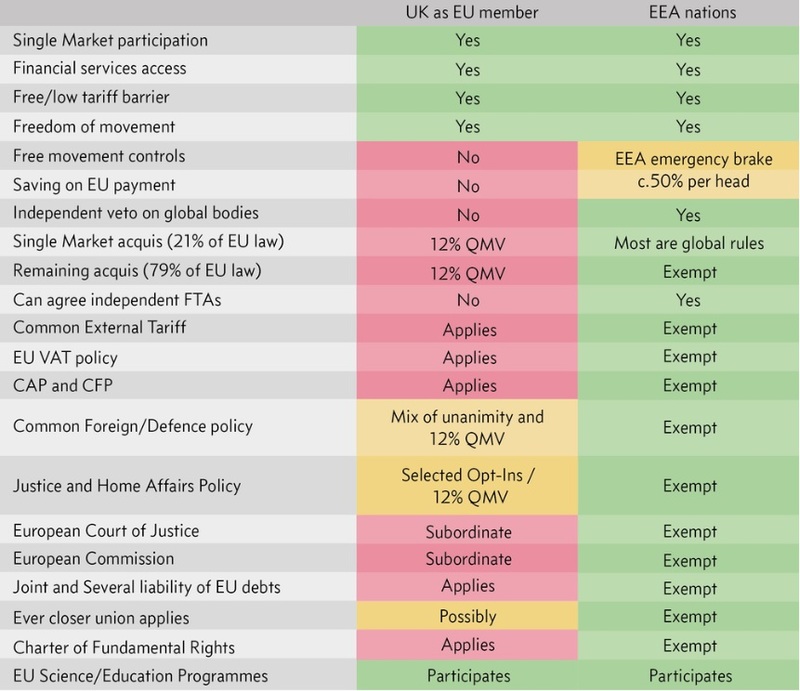 Regardless, any possible slippage on trade between the UK and EU would be more than offset by the likelihood of better policy in other areas. …there’s another basic reason why a Hard Brexit would be in the long-term interests of the U.K….any organization powerful enough to overrule the democratic process in the U.K. regarding economic laws and regulations…is also powerful enough to impose anti-free market policies… And, over time, since men are not angels and power corrupts, any international body with such power would gravitate toward policies that aggrandize the international political elite… In fact, the EU has already issued rules that stifle competition, like setting a standard minimum Value-Added Tax rate. Felix Hathaway from London’s Institute of Economic Affairs, debunks Project Fear in an article just published by Cayman Financial Review. …the only option ahead with a clear path, and requiring no new legislation in parliament, is some form of ‘Hard Brexit.’ …By Hard Brexit I mean the U.K. leaving the EU on March 29 without a withdrawal agreement. Unlike most other options, this does not require the cooperation of the EU to proceed. In this scenario, the U.K. leaves both Single Market and Customs Union of the European Union at 11 p.m. on March 29, 2019, along with leaving the various political institutions of the EU and the jurisdiction of the Court of Justice of the EU. …many of the more alarming warnings of no cooperation at all can be dismissed as fanciful. A more believable ‘no deal’ Brexit might look as follows. …the Commission is doing all it can to publicly rule out this sort of “managed no deal,” yet in doing so has stated that it would unilaterally extend agreements in selected sectors, including for financial services, following a WTO exit. …one could reasonably expect further agreements, possibly at the 11th hour in March… These would likely cover citizens’ rights, road haulage, and facilitated customs checks for certain classes of goods, and would be negotiated with the member states with which the U.K. does the most business. For what it’s worth, I think vindictive EU bureaucrats probably want to inflict some needless harm, even though it will hurt them as much – and maybe more – than it would hurt the UK. But Felix is right that common sense – sooner or later – will lead to agreements to smooth over any bumps in the transition. Indeed, he just wrote another article demonstrating how this is already happening. Here’s the most important part of his article, which I like because it echoes my arguments about the pressure for better policy in an independent United Kingdom. And keep in mind that bureaucrats in Brussels are pushing to make the European Union more statist (which, sadly, is contrary to the continent’s historical tradition), so it’s becoming ever-more important to escape. This is why what happens with Brexit is among my greatest hopes and fears for 2019. Let’s close with a bit of humor. The Cockburn column in the Spectator mocks the New York Times for its anti-Brexit fanaticism. The Times usually supports democracy in backward and violent states, but it hates Brexit. No news is too fake for the Times to print when it comes to Brexit. This week, the Times hit new heights of fantasy. ‘Roads gridlocked with trucks. Empty supermarket shelves. An economy thrown into paralysis,’ a would-be novelist named Scott Reyburn wrote earlier this week. His story, ‘As Brexit Looms, the Art World Prepares for the Fallout’, was recycled as a front-page item on the Times’s international edition. …Britain is in a ‘crazed Brexit vortex’, adds Roger Cohen, holder of the Tom Friedman Chair in Applied Chin-Stroking. …Yes, the British government are useless. But nobody in London is stockpiling food. Nobody is fighting in the streets, as the French are every weekend. The markets factored in their Brexit uncertainty two years ago. The supermarkets and roads are as jammed as ever. …The economy is doing much better than the Eurozone, which is slipping into recession. Polls show the British, who the Times characterize as sliding down a neofascist vortex, to be more welcoming of immigration than any other European people. Bad journalism from the New York Times is hardly a surprise. I’m mostly sharing his column because this satirical paragraph got me laughing. The scene that met Cockburn’s eyes upon exiting the terminal at Heathrow reminded him of his days as a foreign correspondent during the Lebanese civil war, or a night out in south London. A dog was eating the innards of a corpse, because supplies of Romanian dog food have broken down. A naked fat man had carved off a slice of his own buttock and was roasting it over a burning tyre, because imports of Bulgarian lamb are held up at Calais. A woman offered to prostitute herself for an avocado, and to sell both of her blank-eyed children for a packet of French butter. There were no black taxis either, because London’s notoriously pro-Brexit taxi drivers had all joined one nationalist militia or other. Finally, a black-market cheese dealer with a rocket launcher affixed to the back of his pickup agreed to take Cockburn into the city. They bribed their way through the checkpoints with wedges of brie. Or not. Speaking of laughs, Hitler parody videos have become a thing. 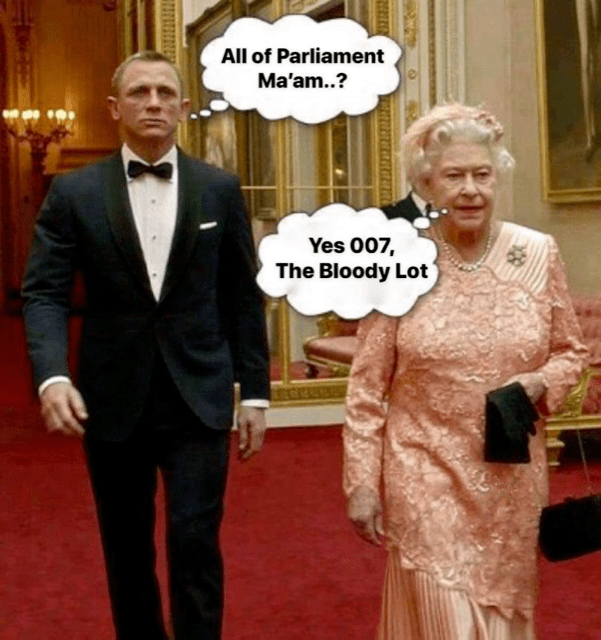 Here’s a new Brexit-related installment in the series. Not as clever as the first Hitler parody I shared as part of my collection of Brexit humor, but it has some funny moments. 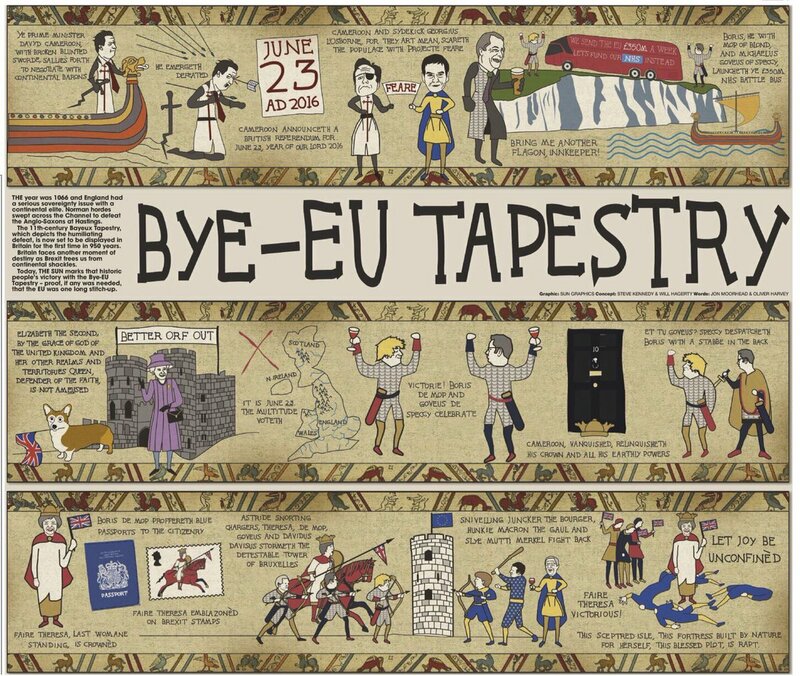 And if you have time, this Brexit tapestry is quite amusing. P.P.S. Though there are many reasons to question whether U.K. politicians can be trusted to adopt good policy. The crises have since abated, largely because of direct and indirect bailouts. But the underlying policy mistakes haven’t been fixed. 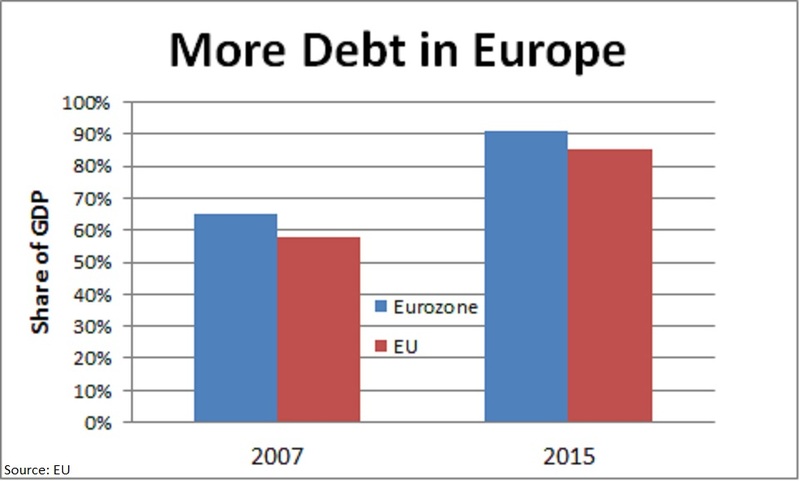 Indeed, the burden of government spending has increased in Europe and debt levels today are much higher than they were when the previous crisis began. Unsurprisingly, these large fiscal burdens have resulted in anemic economic performance, which helps to explain why middle-class French taxpayers launched nationwide protests in response to a big increase in fuel taxes. The French President, Emmanuel Macron, capitulated. But some have suggested that Macron’s problem is that he wasn’t sufficiently bold. I’m not joking. Led by Thomas Piketty, a few dozen European leftists have issued a Manifesto for bigger government. We, European citizens, from different backgrounds and countries, are today launching this appeal for the in-depth transformation of the European institutions and policies. This Manifesto contains concrete proposals, in particular a project for a Democratization Treaty and a Budget Project… Our proposals are based on the creation of a Budget for democratization which would be debated and voted by a sovereign European Assembly. …This Budget, if the European Assembly so desires, will be financed by four major European taxes, the tangible markers of this European solidarity. These will apply to the profits of major firms, the top incomes (over 200,000 Euros per annum), the highest wealth owners (over 1 million Euros) and the carbon emissions (with a minimum price of 30 Euros per tonne). Here are the taxes they propose as part of their plan to expand the burden of government spending. I’m surprised they didn’t include a tax on financial transactions. And here’s a video (in French, but with English subtitles) explaining their scheme. To put it mildly, this plan is absurd. It would impose another layer of government and another layer of tax on a continent that already is suffocating because the public sector is too large. I’m not the only one with concerns. In a column for Bloomberg, Leonid Bershidsky points out why he is underwhelmed by Piketty’s proposal. The reforms proposed by Piketty and a group of intellectuals and politicians — notably Pablo Iglesias, leader of Spain’s leftist Podemos party — include the creation of a European Assembly. 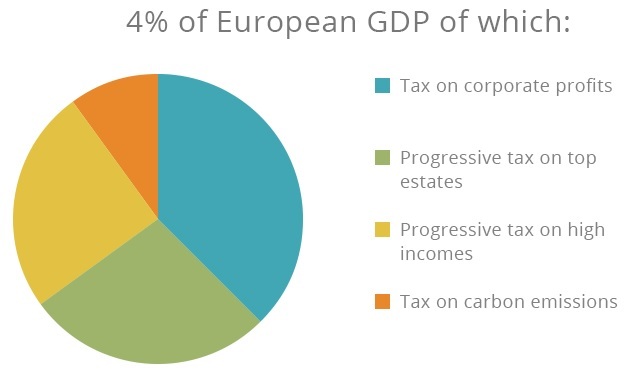 It would have the power to shape a common budget and impose common taxes… Piketty advocates four measures that would collect a total equivalent to 4 percent of Europe’s GDP… What is being proposed is essentially a return to the fiscal policies of the 1970s, which provoked Astrid Lindgren to write her satirical essay “Pomperipossa in Monismania.” In 1976, the children’s author was confronted with a tax bill of 102 percent of her income. …Hit them with new taxes and watch them flee to the U.S. and Asia. They won’t stay like patriotic Lindgren, whose essay helped to topple the Swedish government in 1976. And no amount of government funding…will repair the damage that envy-based taxation can wreak on economies already finding it hard to innovate. Let’s not forget, by the way, the many thousands of French households who also have suffered 100 percent-plus tax rates. Writing for CapX, John Ashmore explains why Piketty’s plan will make Europe’s problems even worse. …a group of politicians, academics and policy wonks spearheaded by…French economist Thomas Piketty…have put their names to a new Manifesto for the Democratisation of Europe. …For the most part, the manifesto reads like a souped up version of the kind of policies we’ve heard time and again from leftwing politicians. …The details of today’s ‘manifesto’ make Labour’s Marxist Shadow Chancellor John McDonnell look like a moderate centrist. Where Labour advocate putting corporation tax back up to 26 per cent, Piketty and co want it hiked to 37 per cent. And while we Brits spent plenty of the Coalition years discussing whether income tax should be 45p or 50p in the pound, the Manifesto goes all guns blazing for a 65 per cent top rate… these measures are projected to raise 800bn euros, equivalent to four times the current EU budget. …that would be a huge transfer of power, not from the rich from the poor, but from taxpayers to politicians. A 65-percent top tax rate? At the risk of understatement, that’s a recipe for less entrepreneurship and less innovation. Moreover, based on America’s experience during the Reagan years, it’s safe to say that actual tax receipts would fall far, far short of the projection. But the higher spending would be real, as would the inevitable increase in red ink. And it’s worth noting that the Manifesto proposes to subsidize the debt of bankrupt welfare states. Very much akin to the eurobond scheme, which I pointed out would be like cosigning a loan for an unemployed alcoholic with a gambling addiction. P.S. During my recent trip to London, I repeatedly warned people that a real Brexit was the only sensible choice because the European Union at some point will fully morph into a transfer union (i.e., a European budget financed by European taxes). It was nice of Piketty to issue a Manifesto that confirms my concerns. 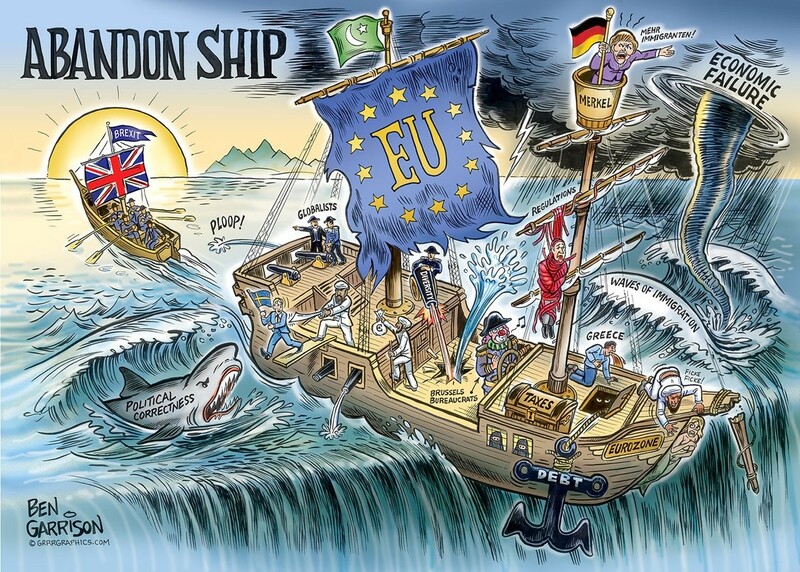 Simply stated, the United Kingdom will be much better off in the long run if it escapes. P.P.S. Let’s not forget that Piketty’s core argument for class warfare has been thoroughly and repeatedly debunked. Indeed, only 3 percent of economists agree with his theory. The theory of “economic convergence” is based on the notion that poor nations should grow faster than rich nations and eventually achieve the same level of development. This theory is quite reasonable, but I’ve pointed out that decent public policy (i.e., free markets and small government) is a necessary condition for convergence to occur. The link between good policy and convergence explains why Hong Kong and Singapore, for instance, have caught up to the United States. 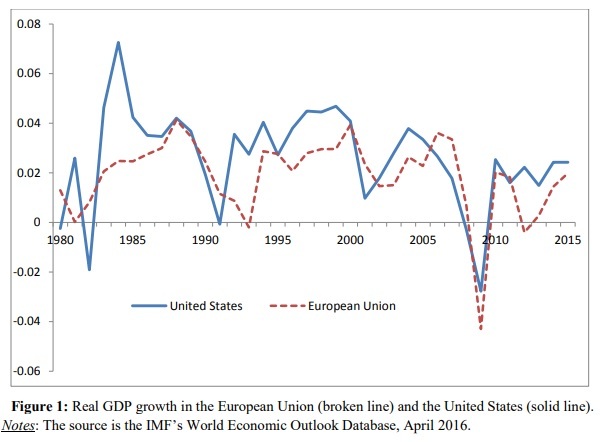 And the adverse effect of bad policy is a big reason why Europe continues to lag. Moreover, it also explains why some nations with awful policy are de-converging. Today, let’s look at convergence between Western Europe and Eastern Europe. Here are some excerpts from a new study published by the European Central Bank. This paper analyses real income convergence in central, eastern and south-eastern Europe (CESEE) to the most advanced EU economies between 2000 and 2016. …The paper establishes stylised facts of convergence, analyses the drivers of economic growth and identifies factors that might explain the differences between fast- and slow-converging economies in the region. The results show that the most successful CESEE economies in terms of the pace of convergence share common characteristics such as, inter alia, a strong improvement in institutional quality and human capital, more outward-oriented economic policies, favourable demographic developments and the quick reallocation of labour from agriculture into other sectors. Looking ahead, accelerating and sustaining convergence in the region will require further efforts to enhance institutional quality and innovation, reinvigorate investment, and address the adverse impact of population ageing. The study is filled with fascinating data (at least if you’re a policy wonk). This chart, for example, shows how many nations are converging (the dots above the diagonal line) and how many nations are falling behind (the dots below the diagonal line). The yellow dots are Eastern European nations, so it’s good news that all of them are experiencing some degree of convergence. But the above graphic doesn’t provide any details. So let’s look at another chart from the study. 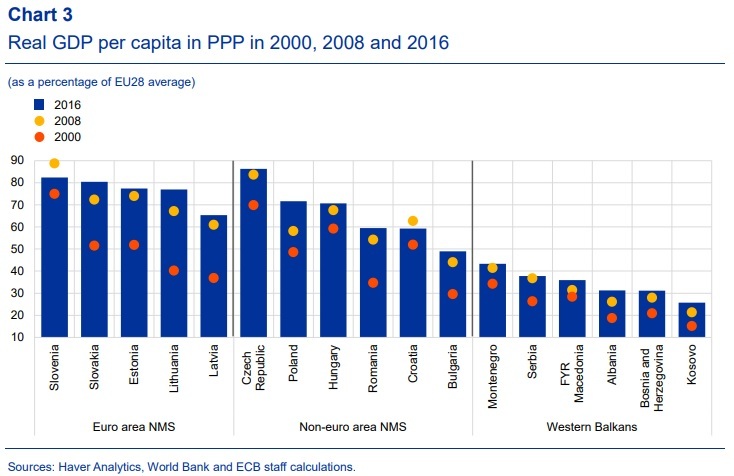 The blue bar shows per-capita GDP in selected Eastern European nations as a share of the EU average. The yellow dot shows where the countries were in 2008 and the orange dot shows where they were in 2000. The good news, at least relatively speaking, is that all nations are catching up to Western Europe. But the report notes that some are catching up faster than others. The developments were…heterogeneous within CESEE countries that are EU Member States. Some of them (the Baltic States, Bulgaria, Poland, Romania and Slovakia) experienced particularly fast convergence in the period analysed. 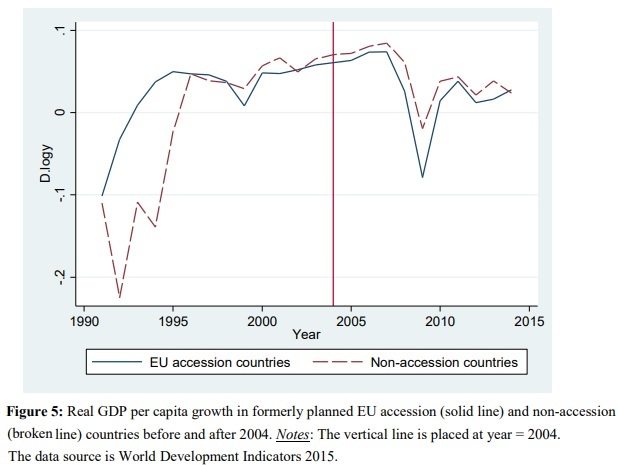 At the same time, other CESEE EU Member States found it hard to converge… In fact, GDP per capita in Croatia and Slovenia diverged from the EU average after 2008… Given these heterogeneous developments, it appears that while in some CESEE countries the middle-income trap hypothesis could be dismissed (at least given their experience so far), in others the signs of a slowdown in convergence after reaching a certain level of economic development are visible. My one gripe with the ECB study is that there’s a missing piece of analysis. The report does a great job of documenting relative levels of prosperity over time. And it also has a thorough discussion of the characteristics that are found in fast-converging countries. But there’s not nearly enough attention paid to the policies that promote and enable convergence. Why, for instance, has there been so much convergence in Estonia and so little convergence in Slovenia? So I’ve tinkered with the above chart by adding each nation’s ranking for Economic Freedom of the World. Lo and behold, a quick glance shows that higher-ranked nations (blue numbers indicate a nation is in the “most free” category) have enjoyed the greatest degree of convergence. Here are some specific observations. The Baltic nations are the biggest success stories of the post-communist world. Thanks to pro-market reforms, they have enjoyed the most convergence. Romania and Slovakia also experienced big income gains. Romania is in the “most free” group of nations and Slovakia was in the “most free” group until a few years ago. Poland has enjoyed the most convergence since 2008. Not coincidentally, that’s a period during which Poland’s economic freedom score climbed from 7.00 to 7.27. 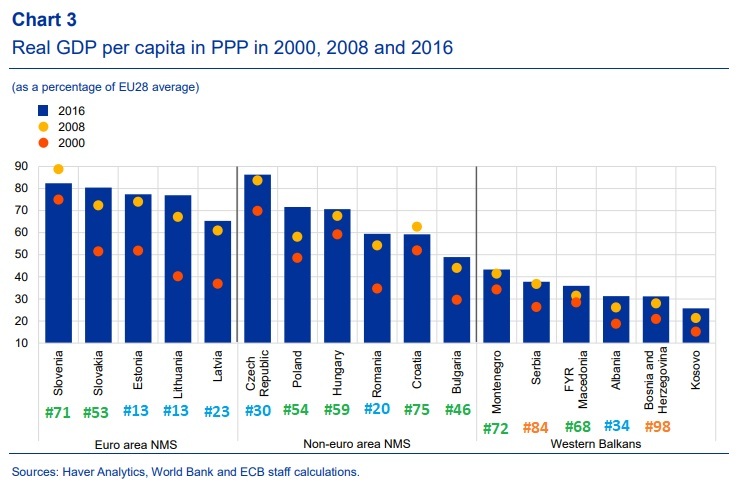 Bulgaria also merits a positive mention for a big improvement, doubtlessly driven by a huge improvement (from 5.55 to 7.41) in economic freedom since 2000. Sadly, Slovenia and Croatia have not experienced much convergence, which presumably is caused in part by their comparatively low rankings for economic liberty. To be sure, there’s not an ironclad relationship between a nation’s annual score and yearly growth rates. 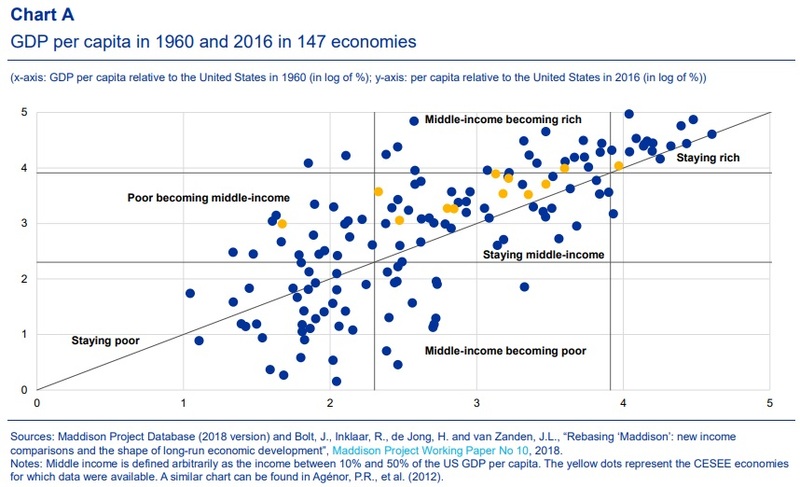 But, over time, poor nations that want convergence almost certainly won’t get the necessary levels of sustained strong growth without high scores for economic liberty. P.S. Here’s some related research on this topic from 2017. 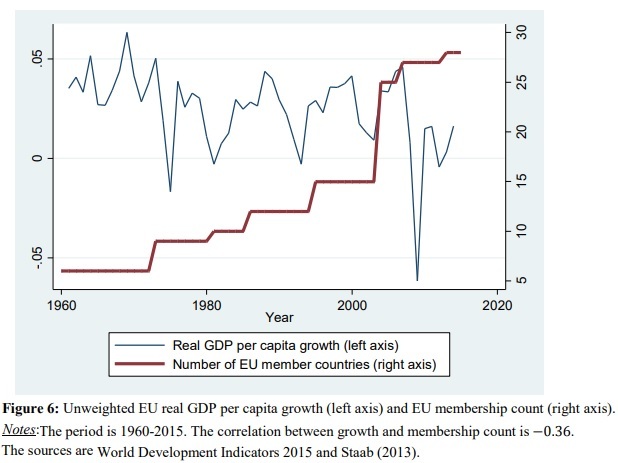 And here’s a column on the evolution of economic liberty (or lack thereof) in Europe.